Create characters, explore the setting, and learn how to play�or just have a handy second set of rules at the gaming table�with this inexpensive player�s alternative to the The Strange corebook. It�s perfect for getting a taste of the game, having an extra rules and setting reference on hand at the gaming table, or for game masters to hand to new players. 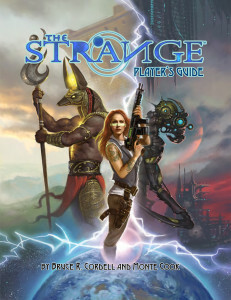 The Player�s Guide is a fantastic, ready resource for anyone playing The Strange, and a wonderful introduction and teaching tool for the game. And it�s an amazing price for a 96-page book!